WordPress user base is ever growing, with thousands of new sites being launched every single day. This has contributed to the steady growth of best WordPress extensions such as plugins and themes which add to the visual beauty of any site build mainly on WordPress platform. This development has also presented money making opportunities to many web designers and developers who design these themes and plugins. With that in mind, developers and designers have been really working hard to serve us with the best and quality themes for 2017 & 2018. If you are planning to launch a new site, or just simply considering an upgrade on your current website, I am going to show you the best themes son that you can choose one that suits your needs and use it to beautify your site and to represent your brand image. So let’s dive in. Realty space is an excellent choice for real estate firms and agents. It comes with features that enable you to showcase your services such as renting, selling and managing. It allows you to also to put your best-performing properties on your homepage for maximum visibility. Support translation, custom currencies, and measurement units. As the name suggest, it is best suited for affiliate marketers and e-commerce stores. It allows you to showcase your products while promoting affiliate products from sites such as Amazon. Kingdom comes with a visual composer plugin that makes it easy to customize the theme. Kingdom is also highly optimized for speed and is very mobile friendly. Peak theme features a nice grid layout which makes it the best choice for photographers, showcasing portfolios, and writing blogs. It has a mega menu on top and slide-in sidebar widgets. One page WordPress theme is easy to use, comes with drag and drop feature making it newbie friendly. Has Twitter feed section, an option to animate counters and pricing table among other elegant features. These makes it most suited for service companies such as email marketing companies and other online companies. The one-page theme is extremely optimized for maximum loading speed. Alpha is a multipurpose WordPress theme that comes with a couple of color schemes. Therefore, giving you an opportunity to choose the one that matches your preference. Has a breaking news ticker, a customization slider and an elegant video widget to present your videos on the homepage. Enfold is an easy to set up theme thanks to pre-made content that makes it possible for you to design an exact match site like the demo; if that’s your preference. Makes it easy picking a layout and you can as well fill it with the pre-made content if you like. It has a very powerful drag and drop page builder and easy to use sliders. This theme, unlike others, comes with its sidebar manager that makes customizing the sidebars an easy task. Enfold theme also support translations and woo commerce, mega menus and portfolio publisher among other features. The magazine is a very responsive theme with lots of amazing features. It has 42 layouts and its builders, content sliders, sliding menus, mega menus among others. Has six colors you can choose from, numerous sidebars, customization widgets and tons of shortcodes that make it possible to add the widgets to pages and posts. Salient is a very popular WordPress theme maybe due to its ability to fit into different niches. This feature makes this theme the best for most site builders. Comes with tons of customization features and pre-made templates which appeal to complete beginners and those seeking to upgrade their sites. Salient has a visual composer tool that enables you to build your pages easily by drag and drop model and a portfolio publishing section to build your credibility. It also offers a landing page template for easy leads capture for follow up or email marketing. I have used the Salient theme for many years and really like it, but recently I have noticed that it has fallen behind other developers. Looking forward in 2018, I'm not sure the Salient theme can keep pace with the look and functionality of some of the other themes on the market today. Kalium is a theme that encourages creativity; it enables you to showcase your work through portfolio section and in case you want to tailor it to suit your needs you can do so with its easy customization options. If you are worried about your coding skills, then worry no more, Kalium theme comes with a visual composer that makes page building an easy task, requiring little or no coding skills. It also features pre-made color schemes making it easy to represent your brand with the colors. Uncode is a developer friendly theme that’s easy to use and customize. It is highly responsive to various devices and exhibits professionally designed graphics. Uncode is a multipurpose theme that answers the needs of each level in site building process. 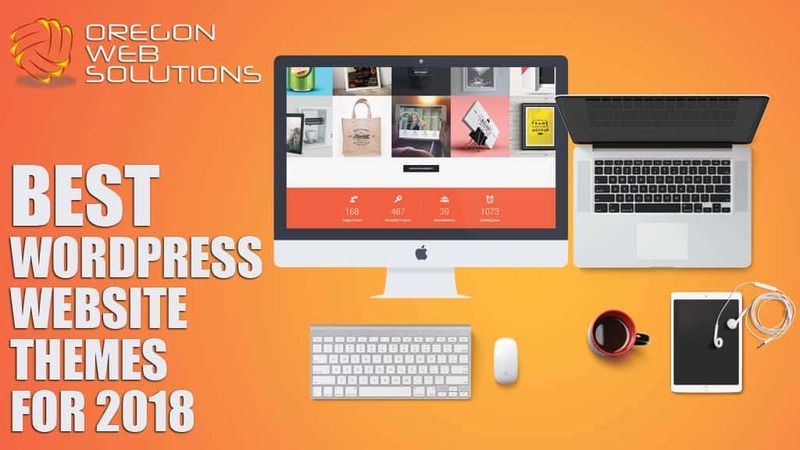 This theme comes with powerful premium WordPress plugins such as revolution slider, drag and drops visual editor among other amazing features that help your site to represent your brands sufficiently. Uncode also incorporates the beautiful feature iLightbox that helps you highlight your media files in a unique and outstanding way. It is a responsive theme and loads faster across all devices and browsers. As you have seen above, these themes come with different features, enabling you as a site owner to pick the best theme that represents your brand’s image. On the other hand, there are lots of customization options, making it possible for you to pour your whole creativity. While most of these themes are free others can be obtained at a small fee. As the saying goes, you get what you pay for, so make decisions based on your desired outcome. I hope you enjoyed our list of the best WordPress website themes for 2018. The new year is just around the corner and it's never too early to start thinking about upgrading your website. If you are looking to create a new website for your business and would like some help, visit our website design page and see how we can help. Don't ever hesitate to call and ask as well (503) 563-3028. You are very welcome Elena! You have collected Excellent Collection. I would like to share one more theme which is best for SEO-Optimized and multipurpose theme, and it is Kosmic WordPress Theme. This theme has WooCommerce plugin supported so that it easily fulfills the requirements of an Online store. It has so many features which make your website elegant and beautiful. Best WordPress Website Themes for 2017 & 2018	Overall rating:	5	out of 5 based on 48	reviews.